Mesic beech-maple forests or, more often, moister deciduous, mixed, or coniferous forests, swamps, and thickets, including northern hemlock-hardwoods, cedar (or tamarack) swamps, floodplain forests, stream borders; sometimes on mossy logs and hummocks in wet areas, occasionally in open ground. More common on glaciated territory is var. palustriformis A. Gray, (V. incognita Brainerd); var. blanda is an eastern and Appalachian plant which does not range into Michigan. 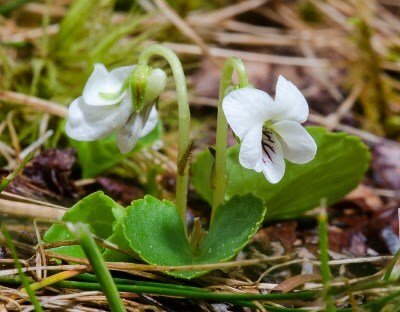 Viola blanda is much more widespread both geographically and ecologically in Michigan than V. renifolia, which is largely restricted to coniferous forests and swamps in the northern part of the state. MICHIGAN FLORA ONLINE. A. A. Reznicek, E. G. Voss, & B. S. Walters. February 2011. University of Michigan. Web. 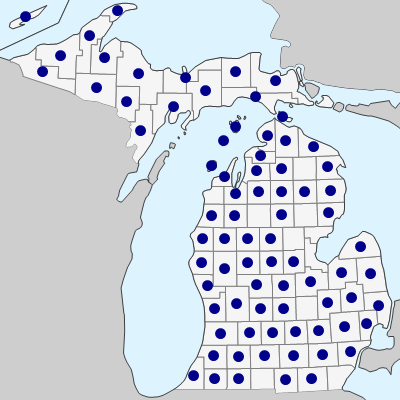 April 22, 2019. https://michiganflora.net/species.aspx?id=2779.